This condo is located in a quiet complex, not a high-rise, and offers unique features such as a cathedral ceiling (24 ft), open living room, and two balconies with unobstructed views of the Gulf. The interiors are stylishly decorated with ceramic tiles, marble mosaics and granite counter tops. The condo sleeps up to 8 guests (1 king bed in master bedroom; 2 twin beds in second bedroom; 2 twin beds in loft; queen sofa sleeper in living room). The kitchen is fully equipped with stainless steel appliances. The master bathroom offers a Jacuzzi tub. Other amenities include washer and dryer; free Wi-Fi internet access, LCD HDTV, cable service and DVD player.The dining room includes a bar area with wine cooler. Guests have access to a shared, private pool. 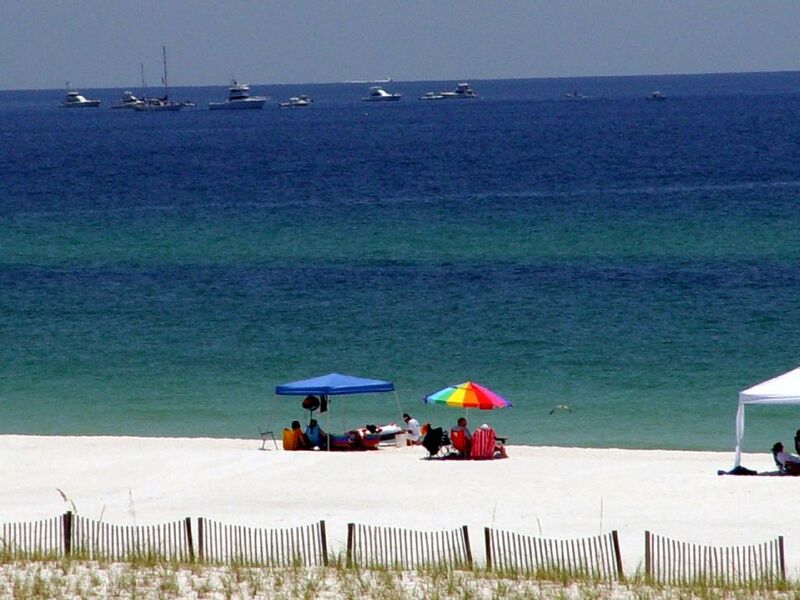 The condo is situated on beautiful Pensacola Beach at the entrance to Gulf Islands National Seashore park. Miles of pristine beaches where to enjoy bird-watching, fishing, sea shell hunting, are just few steps away. Come to enjoy the Emerald waters of the Gulf and to recharge, or simply to relax. Whatever the reason, you will bring home memories that will last a lifetime. Age limits: must be at least 25 yrs old to rent. Beautiful beach rental with plenty of space. Home atmospher. Would definitely use this vacation rental again. The condo was really nice. However, the jets in the tub did not work. We had no Wifi on Friday the 8th. And the coffee pot was full of coffee grounds in the water compartment as well. Luckily we checked the night before. and cleaned it out. We did have to go into the owners cabinets for vinegar hope they don't mind. But, it had to be done. May want to mention it to the cleaning crew for next time. It was very cozy and relaxing other than the things mentioned. The location is spectacular! The home is large with plenty of room, clean, well maintained and overall a great place. Wet bar is a great bonus, 2x balconies facing the Gulf are perfect for morning coffee. Cute park with a kids playground is located right next to the home. Overall this experience was great! Thank you so much for opening your home to us for vacation! The condo is located in the perfect location for beach activity. I would recommend the rental to friends and family. Suggest a different cleaning contractor, the showers and bathrooms were surface clean but really in need a deep cleaning. The same for the rest of the condo it was clean but really in need of a deep clean. We realize with the recent weather conditions and the end of the season you could be in transition. We also would have benefited greatly having a guest book with suggestions for local food, music, activities, chair/umbrella rental, kayak rentals etc. Condo information such as where to take out the thrash bags, recommendations for where to hang the gear, swimming pool location, bay side beach access, where to locate the hose for the outside faucet. The property was not very clean and not well stocked. Our feet turned black if we walked around with out shoes. There was no bedding for the pull out couch or the trundle bed. The mattress on the pull out couch was disgusting and full of stains. I let the owner know about the bedding and he said he would let the cleaning company know but we never heard anything back. Not sure if it's the cleaning company or the owner. We are sorry you found our condo disappointing. I did check the sofa sleeper mattress after your review and I agree that the mattress should have been replaced. I think that what happened has to do with the fact that the sofa sleeper is rarely used so the cleaning service does not routinely inspect it. That mattress is gone now and a new one one is being shipped to replace the old. As for the floors being "dirty" I totally disagree with that statement. Our condo is throughly mopped before each and every new guest. The fact that walking on tile floors in a condo located fifty feet from a sugary sand beach (on three sides), leaves "dirty feet" is no surprise. My experience is that it is impossible to eliminate sand on this island from tiles in a condo located on the beach like ours. Now, as for the complains about the linens, etc...What happened is the following: the guest upon arrival notified me that there were missing linens. I contacted the cleaning service immediately and I was told that there were plenty of extra linens in one of the closets. I notified the guests immediately regarding the location of the linens. The other complain was related to the wi-fi not working. I fixed the problem also very promptly. I believe that the guests might have overcrowded the condo (the maximum number allowed is 8), which would explain the need for lots of extra linens. Now, about the guests: upon their departure the cleaning service reported that the condo was in a total mess, with garbage everywhere. Also, the door in one of the closets was damaged and put outside the rail. Finally, it was reported that a cloth wood drier was completely destroyed and had to be discarded. I never charged them for these damages. Finally, it is sad that the only note left on a condo that is located in one of the most beautiful beaches in the world with astonishing views from almost all rooms, decorated with tiles, mosaics, and custom made furniture, has to do with a sofa sleeper mattress and sand on the floors... Frankly, I only regret that I did not write an appropriate review about them to warn future hosts..
Credit card payments accepted: 2.5 % credit card fees. A damage deposit of $ 200 is required to hold your reservation. Once the deposit is received your dates are officially booked. Your damage deposit will be refunded within 2 weeks after your departure date.